Paris can either referred to as the City of love, fashion or simply the City of lights. It is not only a picturesque romantic gateway, but also a perfect wonderland for families including children and teenagers. Magnificent buildings, monuments, gothic churches, opera and concert halls, amusement parks, world class shopping facilities, the incredible experience of sitting in the most recognizable Parisian cafes and delightfully watching the world go by are some of the major reasons why it is one of the most popular tourist destinations. The most recognizable landmark of the city’s skyline-the Eiffel Tower was built by Gaustave Eiffel in the year 1889 and weighs about 7000 tons. But its spectacular view has the power and the magic to mesmerize every visitor making them forget about these facts and figures. No other monument can symbolize Paris in a better way. One can get the brilliant view of the entire lit up city from Altitude 95 which is situated inside the Tower itself. Louvre Museum; the place to exhibit the royal collection, antique sculpture, etc is one amongst the many places to explore in France. Situated at the right bank of the river Seine, Louvre museum or simply Louvre is a historic monument and the largest national museum of France. Though most of the tourists come here to see the famous Leonardo da Vinci’s Mona Lisa painting work, the walls in the entire museums are lined by equally beautiful masterpieces. The best way to explore this city of endless surprises is to walk around the streets of Paris occasionally rest in the excellent street cafes, restaurants and bars scattered all over the city. 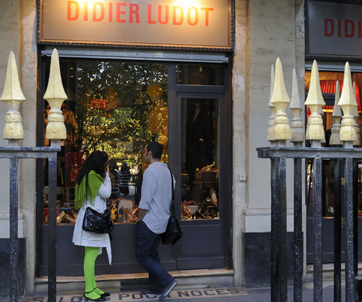 Paris tops the chart when it comes to art, culture, food and drinks. There are fabulous sidewalk cafes, bars and restaurants in the city where one can experience the pleasure of sipping the hot steaming creamy coffee and having chocolate muffins in the chilled weather. Some of the other most renowned Paris cafés include Café de la Paix, Les Deux Magots, Café de Flore, Le Fouquet’s, Le Deauville. Some of these famous cafes and bars are sightseeing destination places themselves. Located just inside the oldest entrance to the Jardin des Plantes on rue Geffroy St. Hilaire, “Fontaine Cuvier” is amongst the most unusual places to visit in Paris Ile de France. Here is an amazing sculpture of a lion created by Henri-Alfred Jacquemart in 1854. The most unusual thing to observe is that the realistic sculpture is of the lion ravening a human being who is left with nothing but just a foot!!! After Tuileries and Villette, Parc des Buttes is the third biggest parks in Paris and definitely deserves a special mention. Once the site was quite a mess; filled up with gypsum, quarries, and garbage. But later it was converted to a fantastic park by Napoleon III and his city planners. Now the park tops the list of the unusual places to be visited in Paris with certain special features like man-made cliffs, man-made lake, grotto and lots of exotic plants all labeled with their name and place of origin, etc. This entry was posted in Basic Travel Tips for Travelers to Paris and tagged Café de la Paix, Jardin des Plantes on rue Geffroy St. Hilaire, leonardo da vinci, Louvre Museum, mona lisa painting, sidewalk cafes, streets of Paris, travel, Tuileries and Villette. Bookmark the permalink.